In the 11th century i.e. in the post-Mahmud Ghazni era, the most powerful Hindu Kingdom in North India was that of the Gahadwalas or Rathods who were a Rajput clan. The founder of the Gahadwala line was Chandradeva, whose son Govindchandra Gahadwala was the most illustrious ruler of this line. Govindchandra was an astute ruler and ruled from Kannauj. Most of North India, including the university town of Nalanda was a part of his kingdom. He stoutly defended his kingdom from further Muslims incursions. He instituted a tax for this purpose which was called Turushka Danda (i.e. tax to fight the Turushkas or Turks). His grandson was Jaichandra Gahadwala (Rathod) who played a tragic role in Indian History. The story of Prithviraj's bold exploits spread far and wide in the country and he was the center of much discussion in the circle of the nobility. Sanyogita, the daughter of Jaichandra Gahadwala fell secretly in love with Prithiviraj and she started a secret poetic correspondence with him. Her father the haughty Jaichandra got wind of this and he decided to teach his daughter and her upstart lover a lesson. 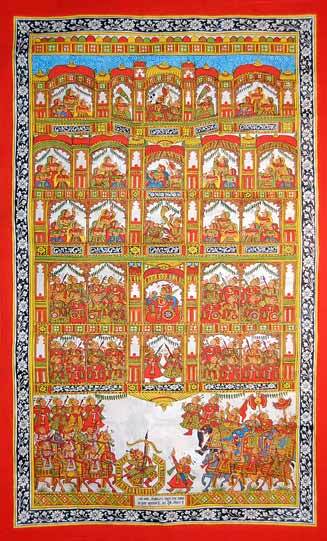 So he arranged a Swayamwara (a ceremony where a bride can select her husband from the assembled princes. She had the right to garland any prince and she became his queen. This is an ancient Hindu custom among Royalty). Jaichandra invited all the big and small princes of the country to Kannauj for the royal Swayamwara. But he deliberately ignored Prithiviraj. To add insult to injury, he even made a statue of Prithiviraj and kept him as a dwarpala (doorman). Prithiviraj who was hiding behind the statue, also in the garb of a doorman, whisked Sanyogita away and put her up on his steed to make a fast getaway to his capital at Delhi. Jaichandra and his army gave earnest chase and in the resultant string of battles between the two kingdoms fought between 1189 and 1190, both of them sufferred heavily. While this drama was being enacted, another ruler also named Mahmud who was from Ghori in Afghanistan had grown powerful and had captured Ghazni and subsequently attacked the Ghaznavid Governor of Punjab and defeated him. The kingdom of Mahmud Ghori now stretched up to the domains of Prithiviraj Chouhan. A clash was inevitable. Mahmud Ghori threw the gauntlet by laying siege to the fortress of Bhatinda in East Punjab which was on the frontier of Prithiviraj's domains. Prithviraj's appeal for help from his father-in-law was scornfully rejected by the haughty Jaichandra. But undaunted Prithviraj marched on to Bhatinda and met his enemy at a place called Tarain (also called Taraori) near the ancient town of Thanesar. In face of the persistent Rajput attacks, the battle was won as the Muslim army broke ranks and fled leaving their general Mahmud Ghori as a prisoner in Pritiviraj's hands. The very next year Prithiviraj's gesture was repaid by Ghori who re-attacked Prithiviraj with a stronger army and guilefully defeated him by attacking the Rajput army before daybreak. (The Hindus incidentally followed a hoary practice of battling only from sunrise up to sunset. Before Sunrise and after Sunset there was to be no fighting- as per a time honored battle code).The defeated Prithiviraj was pursued up to his capital and in chains he was taken as a captive to Ghor in Afghanistan. "Char bans, chaubis gaj, angul ashta praman, Taa Upar Sultan hai. Ab mat chuko Chauhan." (Ten measures ahead of you and twenty four feet away, is seated the Sultan, do not miss him now, Chouhan).